Soup vegetables of your choice. Meatballs optional. 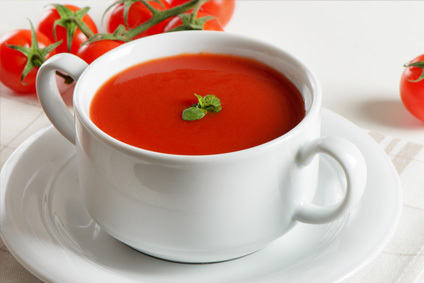 Place the Enjoy tomatoes and the Sweet Enjoy tomatoes in a large saucepan. Add the stock cubes, a tablespoon of curry ketchup or curry sauce and two tablespoons of ketjap manis (sweet soy sauce). Half fill the saucepan with water. Boil for about 30 minutes until cooked. As soon as the tomatoes are done, liquidize with a hand-held mixer and then strain to remove the skins and the seeds. You can add soup vegetables and meatballs if you wish. If you prefer a sweeter taste, then use more Sweet Enjoy tomatoes. Not such a sweet tooth? Then add more Enjoy tomatoes.